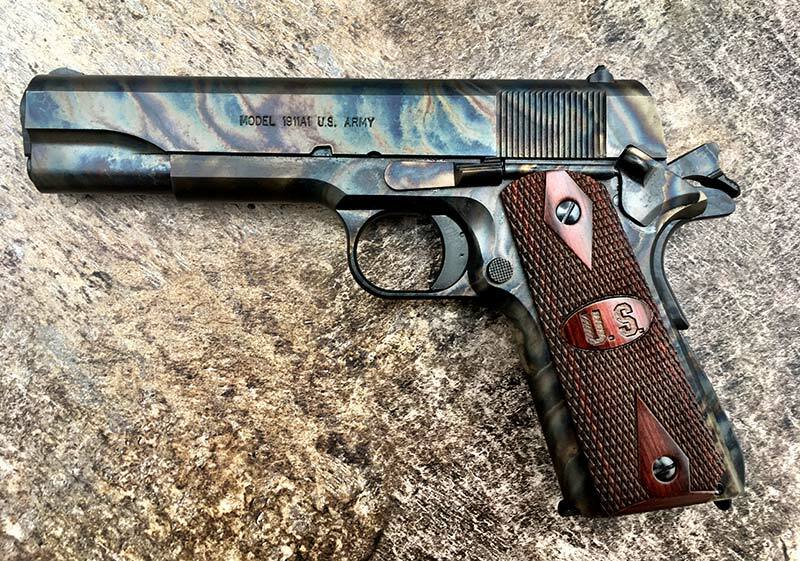 American Handgunner | EXCLUSIVE: SPRUCING UP AN OLD CLASSIC… AUTO ORDNANCE 1911 - Auto-Ordnance | Original manufacturer of the world famous "Tommy Gun"
The 1911 is the most recognized and highly respected pistol to most mere mortals. Successfully serving our military for 75 years, it became the unparalleled standard in the civilian market for home defense, concealed carry and competition. The sight alone of the slab-sided shooter fills hearts with pride, especially portrayed in the rugged G.I. form of John Moses Browning’s patented pistol. Calling it an old “warhorse” accurately describes its intended use for fighting men from WWI through the Vietnam War, and until its retirement in 1986. The no frills design is simple, functional and reliable; three words warriors appreciate during battle. Holding a G.I. 1911 in hand, admiration seeps within, reminding us of the greatest generation who walked before us… true patriots. Those men knew what had to be done!